CUPE convention delegates marked October 4, a day that honours the lives of missing and murdered Indigenous women, with two moving and powerful events. Introduced by CUPE President Mark Hancock at the start of the morning agenda, dancers Jade Brown and Amanda Gould lit up the stage in a multimedia performance that uses dance and video – as well as the driving rhythms of A Tribe Called Red’s “Electric Pow Wow Drum” – to tell the story of Canada’s stolen sisters. The piece, first performed at the Canadian Labour Congress’s human rights conference in 2016, is a moving tribute by Canada’s unions to the lost lives of the country’s missing and murdered Indigenous women, and a compelling call for justice for them and for their families. At the end of the performance, an on-screen message reminded us that Indigenous women are seven times more likely to be murdered than non-Indigenous women. At noon, hundreds of convention delegates followed Gloria Lepine and Nathalie Claveau, representatives on CUPE’s National Aboriginal Council, to Olympic Park for a Sisters in Spirit vigil to honour the lives of missing and murdered Indigenous women. One of hundreds held across the country on this day, the vigil attended by CUPE convention delegates included an homage to the work of artist Jaime Black, who created the REDress Project. 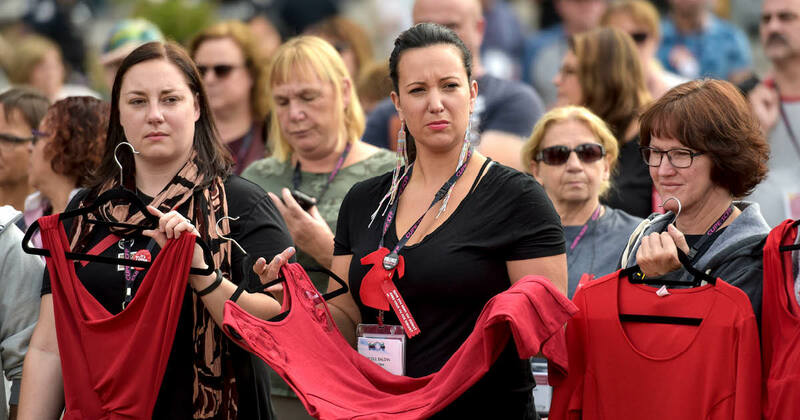 Throughout the vigil, CUPE leaders and delegates carried red dresses and wore red ribbons, in an echo of Black’s “aesthetic response” to the estimated 1,200 missing and murdered Indigenous women. Sisters Lepine and Claveau ended the vigil with a minute of silence—but not before calling on their fellow CUPE activists to continue demanding justice for missing and murdered Indigenous women and their families.